A recent Property Casualty 360 report challenges the “Anderson Cooper 360” collision repair broadcast and touts the benefit of aftermarket parts, but sources omit a few details, and the piece might ultimately help pro-OEM shops more than hurt them. Here are some highlights from the article combined with what its sources didn’t say — as well as some points they made that could be beneficial to certain collision repairers. As we observed with our other closer look at a pro-insurance argument, both sides can certainly pull out their own “lies, damned lies and statistics” to suit them. But you don’t often expect the other side to start arguing for your point of view. Omissions: Reputable shops guarantee their work, so that’s a bit misleading to pretend they don’t. Thanks! 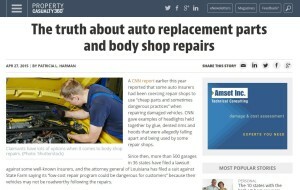 : Insisting that a shop meet I-CAR requirements is good advice for consumers in general, but it might mean you’re more likely to get a shop who will raise the kind of issues as the Anderson Cooper report. It could, in some cases, highlight the lack of training at some insurer direct repair program shops, as a recent I-CAR presentation indicated. Less than 6,100 shops in the entire 35,000-shop industry (17,500 of which were in direct repair programs) are I-CAR Gold Class, and only 8,822 were going through the I-CAR program, according to data from I-CAR CEO John Van Alstyne. Also, asking a shop about the parts also could spotlight the kind of controversial components raised in the Anderson Cooper report or arguments like these from Nissan that non-OEM parts can affect resale value and manufacturer warranty. Thanks! : The Edmunds article states: “When it comes to collision repairs, make sure you are getting OEM parts, since aftermarket body panels may not fit properly or have proper crumple zones for crash safety.” It also raises the resale value and warranty issues as the Nissan brochure referenced above. Observations: Certified Aftermarket Parts Association Executive Director Jack Gillis told Property Casualty 360 that his group’s “rigorous quality certification program enables shops, insurers and parts distributors to identify high-quality, safe and good-fitting alternative parts.” He also told the site that CAPA certified 61 percent more part applications and OK’d 30 percent more parts for sale in the first half of 2014 than it did in 2013. Omissions: Recent versions lawsuits by collision repairers against insurers question CAPA’s impartiality. For example, Indiana Autobody Association et al v. State Farm et al points out that CAPA’s board of directors includes representatives from the nation’s top 3 insurers State Farm, GEICO and Allstate as well as executives tied to Gerber Collision and ABRA, which both have DRPs with those three insurers. The article also features Chen talking about how 90 percent of Maxzone lights and mirrors are tested to ensure a proper fit, and he mentions that U.S. Department of Transportation approval of lights is necessary. Omissions: The DOT technically doesn’t approve anything — a manufacturer has to certify that it does — according to the Specialty Equipment Manufacturers Association. Plus, just because Maxzone has its act together doesn’t necessarily mean that other aftermarket parts will work so well. Thanks! : Recommending that a policyholder ask a collision repairer if the parts can really restore a vehicle or if the manufacturer is trusted — well, that question has got to be music to the ears of the repairers who are attacking non-OEM parts.